I am a Landscape gardener specialising in leveling and terracing sloping gardens ask me for a price to level your garden or follow my D.I.Y. tips. What materials are used to terrace a slope. Sloping garden, building retaining walls. How to level a slope yourself? Sloping Uphill & Sloping Downhill, design tips. Where to put the soil when leveling a slope. Design for a sloping garden. Terracing or leveling a sloping garden adds interest and creates workable space, allowing planting at different levels, maybe flower borders and a patio on the top terrace and a vegetable patch lower down the slope, with a herb garden near the kitchen. The combinations are endless once the slope has been leveled. For gardeners, plant choice is not limited by soil erosion, for families, space is created for children's play areas and entertaining. Leveling or terracing sloping gardens, require a different design and build approach, depending whether the slope is away or toward the house. Things like wall facings and lighting. If you are leveling your garden to make it easier to get around because of age or problems that affect mobility, pathway surfaces and steps will become important considerations. garden design for elderly explains. 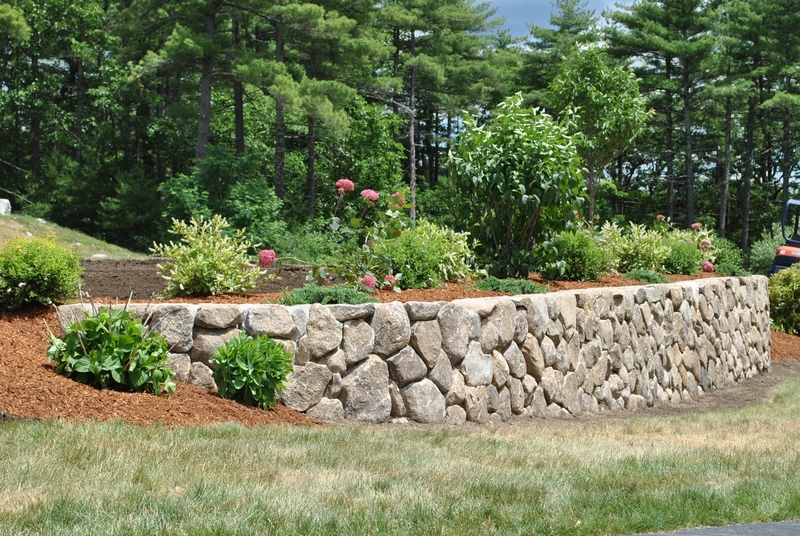 Gabions filled with stone or rubble), are being used more and more in domestic landscaping for building safe and attractive retaining walls. Leveling a sloping garden makes gardening easier and creates outdoor dining and play areas. If your garden has a steep slope, planned landscaping can make it usable again, read on for D.I.Y. materials used to terrace or level a sloping garden. These are some of the most popular materials used for terracing a garden slope. Stone retaining walls using pre-formed concrete stacking blocks (not cheap), breeze blocks, house bricks or natural stone (expensive). Reclaimed railway sleepers are fairly cheap and treated to last. But the downside with railway sleepers is the oil and tar used to preserve them making them unsuitable for sitting on or contacting with bare skin, especially if you suffer from allergies. New sleepers are a cleaner, but slightly more expensive option to build the retaining walls from. They will need to be treated over the years to prevent them from rotting. Gabions (wire cages filled with stone or rubble), are being used more and more in domestic landscaping for building, cheap, safe and attractive retaining walls. Can I level a garden slope myself? Yes you can. Leveling and terracing a sloping garden takes a lot of time and effort. Shifting earth, maybe digging out clay, but yes it is a job you can handle yourself.....bear in mind though, if things start to go wrong and you end up calling in landscape gardeners to put it right, when the walls retaining the terraces fall down, it will cost lot more in the end. It is very very important to get the retaining wall right. How to build retaining walls to terrace a sloping garden. You can use a range of materials to form the retaining walls from the two main ones we have discussed earlier, treated wood or stone, through to house bricks (reclaimed brick makes an attractive wall), concrete, quarry rocks and if the terracing isn't very steep you can use compacted piled earth. The durability of the wall will depend on the material you use and the quality of the footings you build the wall on. Basic design advice for building a retaining wall. Try to keep the maximum height of your walls to about two foot. If you build higher make sure the retaining wall leans slightly back into the soil. Retaining walls take a lot of pressure from the weight of the soil and rain water (a single cubic foot of wet soil can weigh up to 100 pounds). If you are using cemented stone or concrete to retain the terraces in the slope, form weep holes in the bottom of the wall. High retaining walls have the greatest risk of failure. As the retaining wall height increases, the force trying to topple the wall increases by a large factor. For example, if you double the height of a wall, the tipping force can increase by a factor of three or four times. 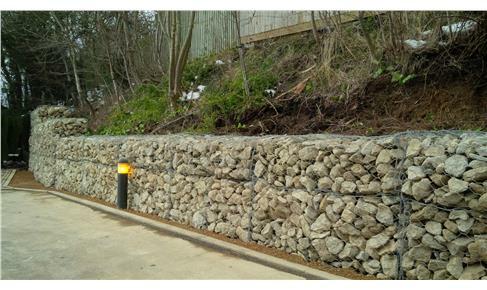 More information about retaining walls and using dry stone walling to level a slope. To save time shifting soil from one area to another we use the dig and fill method to form the terraces, digging out soil to level one area, and using this soil to fill the lower areas. If you plan it right you won't have a lot of topsoil to get rid off. How long will it take to level a slope. Doing it yourself will depend on the size of the garden, the steepness of the slope, access to the skip and how much help you can count on. If I can get a digger onto the slope. The leveling and terracing work normally takes me a couple of weeks in a small to medium garden. 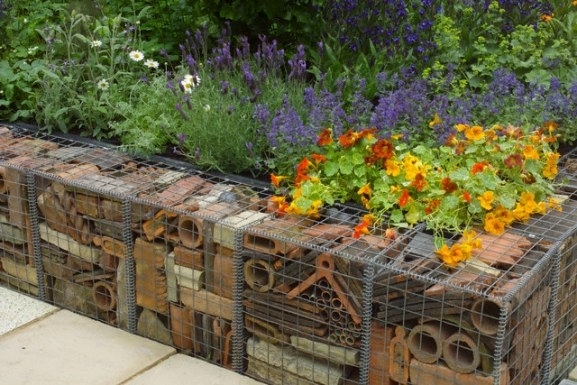 Block-shaped wire mesh baskets, you fill with stone or rubble, Inexpensive and attractive alternative to conventional brick, breeze block or sleeper retaining walls. Gabions are made of durable, coated wire mesh with a mesh size of 5 x 10 centimeters.Installation is quick and easy and ideal for D.I.Y. as you wont need special tools or skills. Just follow the instructions that come them. Construction tips for gardens Sloping Uphill or Sloping Downhill. Uphill slopes and downhill slopes need a slightly different approach at the design stage. On a downward slope you only see the tops of steps and walls when they are viewed from the house. But they are the focal point when you are looking at the house from the bottom of a sloping garden. Downhill slopes often look better with straight walls, sweeping paths and gradual slopes. 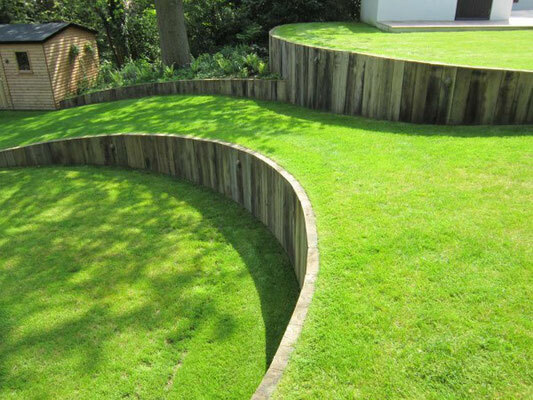 Uphill slopes look better when the walls are curved making the retaining walls garden features. To get a an idea of what you will end up with, stand at the bottom of the slope when you are designing the terraces into the slope. It can be expensive to terrace and level a sloping garden, but will be easier to maintain, look better and create something you can safely use again. Plants and shrubs can be dug out, planted in containers and flowerpots and saved for replanting when the terracing is complete. Working around plants is time consuming. Plants that like to flow down slopes like coneflowers, black eyed susan, garden phlox, shasta daisies, purple russian sage, herbs like catmint and creeping phlox work well on the edge of a terrace. Plants like artemesias and soft wooly lambs ears with grey or silver foliage add contrasting colour against brighter blooms and dwarf evergreen shrubs. Birdbaths, bird feeders, big flowerpots and trellises all add interest. But don't go over the top in a small sloped garden. Too much clutter makes it look smaller, design tips can be found on my small garden page. The pictures show examples of a small job in Bristol and a large landscaping job near Bath in Somerset. We worked to the clients own garden design on the Bristol garden. Our garden designer worked with the client on the design for the larger sloping garden in Clevedon. Tips for designing a sloping garden. What features can I include in my terraced garden. What you include in your sloping garden design will depend on the size. Creating to many different levels will mean that terraces could be too small to build a comfortable dining area. The golden rule for a paved terrace is that it is big enough to dine and entertain without falling of the edge. To work out the space you will need place a dining table in the middle and place six chairs around the table, now move the chairs back 18". That's the minimum space you should aim for and don't forget to include space for the BBQ! You may of course be unsociable and more interested in growing your own vegetables than entertaining. I am, that's what my wife says anyway! If like me, a growing area is more important than paving, include space for a compost heap. If you can't completely level the growing area, a slight slope won't effect the plants. A family with young children might want to include a safe play area and maybe a sand pit/shed to store the kids' toys. If you are not including a paved terrace, aim to have plenty of natural seating spread around the garden. The tops of stone retaining walls and sleeper raised beds make great places to sit and ponder. Try to have seats spread around to follow the sun. Also, make the tread of your steps wide enough to sit on. Water features and streams running from the top to the bottom work well and look good in a sloping garden. They seem to connect the various terraces together and the sound of running water bubbling over pebbles is something else. For the reasons we have covered above, if possible avoid very high retaining walls. If your garden slopes away from the house and you're planning a patio area directly outside the house, the further into the slope the patio extends the higher the retaining wall will need to be. A higher retaining wall will need more steps to access the next level. With a downward slope away from the house, it might be worth considering positioning the patio on one of the lower levels rather than sacrifice dining and entertaining space. Remember the formula, table, six chairs pulled back at least 18 inches. What do you want from your leveled garden. You can see why it is worth taking time to think about your new terraces before you start leveling the slope or calling in a landscape gardener to do the groundwork. When I am called in to price a terracing job, I always ask this question "What will be the main purpose of the new terraced garden?" It's expensive to make major design changes once the leveling is started. Illuminating slopes, terracing and steps. Don't be put off by the cost, or hard work if you are going to do the work yourself. Soil erosion, areas you can't get to and slippery slopes can be a nightmare, especially as we get older. With some thought and hard work it really can be turned into a safe place to enjoy using again. If drainage is a problem, visit my lawns and garden drainage page. Creating space to build functional patios and kids safe play areas. For gardeners stopping soil erosion and rain water washing the nutrients and seedlings away. For older gardeners, the main benefit after leveling the slope and forming terraces, is the garden will be easier to work on and get around. Make it an enjoyable place to be in, instead of a daily challenge.